Apparently the residents of Gungahlin have had enough of being a lower priority to other areas of Canberra. According to the road signs off the new Majura Parkway, Gungahlin has gone it alone as a city. It is now separate to the rest of Canberra. Have a look at the sign above; Canberra is to the left and Gungahlin is straight through. Lucky them – I hope they now elect their own chief minister or mayor. Canberra has a problem with identifying its city centre – being Civic to most of us. As you travel around the suburbs it is variously called ‘City’, ‘City Centre’ ‘Canberra City’ and, of course, ‘Canberra’. I am not sure what the people of Tuggeranong think when they see the signs that point north to the ‘City’. Did they think they were part of the same city as the rest of Canberra? Maybe the sign makers live in the centre of Canberra and regard everyone else as being somewhere else. Signs can be mysteriously misleading if you are not familiar with what they are trying to communicate. 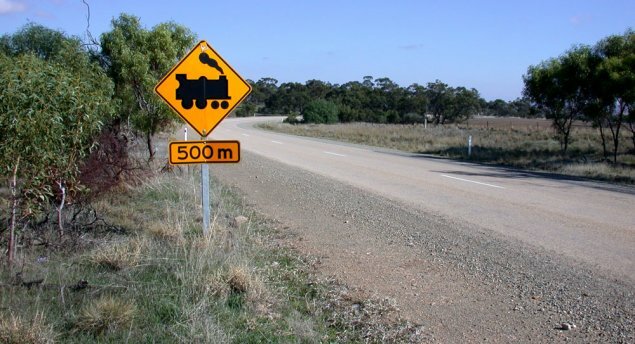 For instance, what generation of Australians would expect to see a puffing steam train crossing a major highway. Apparently they are out there somewhere. And then there are those pesky Australian animals. 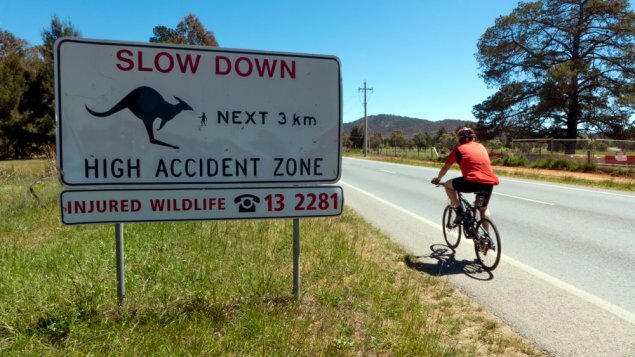 An American colleague asked what animal was that when she saw the sign below. If you had no idea what it was and were used to large bears, your expectations could be totally different to those of us here in Australia who know what it is supposed to represent. 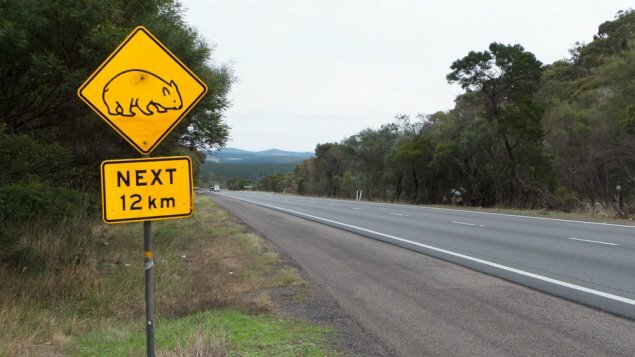 Then the sign makers have confused it more by placing one of those bear-like signs alongside that of a kangaroo. If you did not know, would you now expect them to be both of the same size? Then there are signs that can cause some quite smiles given their placement. 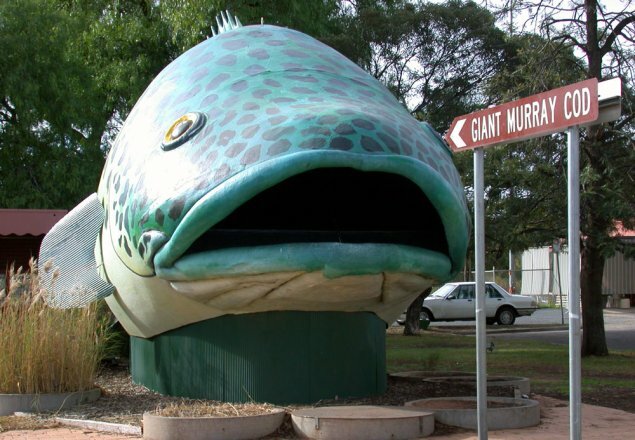 For instance, there is this sign in Mildura plonked right in front of the giant murray cod – just in case you missed it. Or there was this sign for a bank in Manly. 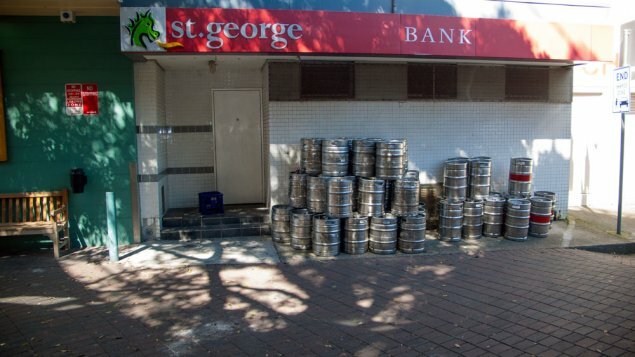 Unfortunately, due to the placement by someone else of those beer barrels, it looks as though that bank has indeed been enjoying their huge profits. But my best signage experience was a couple of years ago outside Tucson, Arizona. 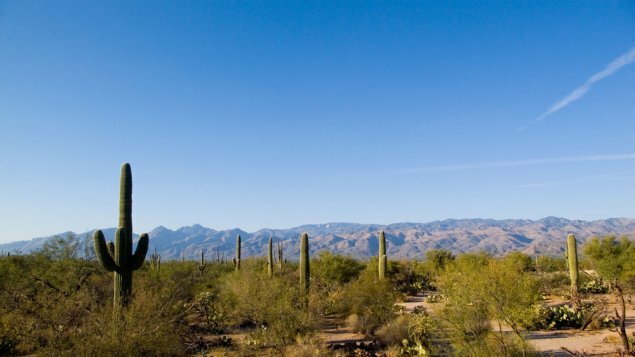 Having left my partner to her conference, I hired a car and headed off into the desert, which is also a national park. After speaking to some park rangers I headed out looking for sites with indigenous rock carvings and to enjoy the fantastic scenery full of cactus of many shapes and sizes. It was while walking up one trail that I came across this sign (below). 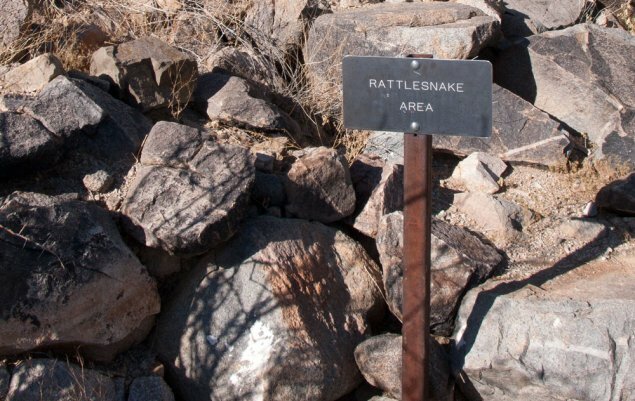 I have watched my share of American movies and know the dangers of rattle snakes. I carried on but it sure did make me far more alert as I climbed the next set of rocks. Then there was this one that really shook me up. I had pulled up at one of the sites suggested and was met with this sign (below). 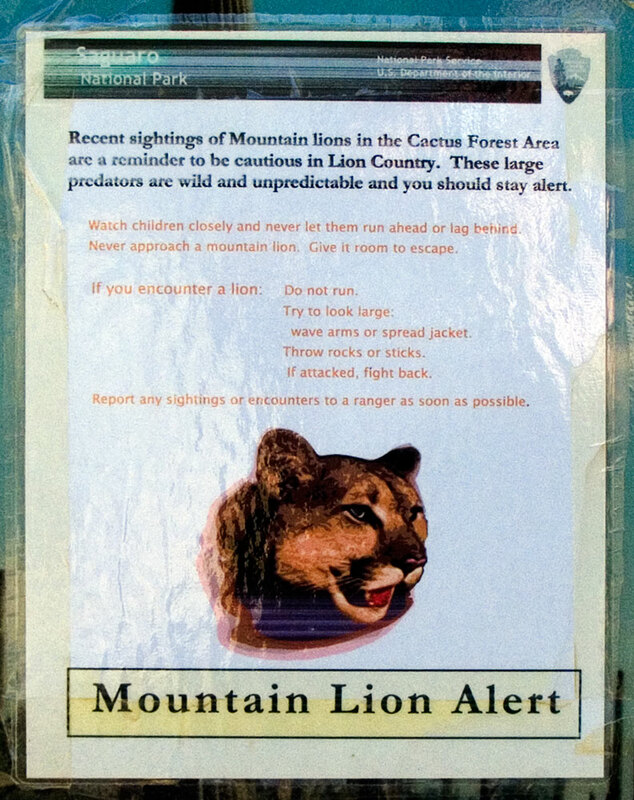 It was just as much to do with the casual nature of the advice on how to react if confronted by a mountain lion. To understand my position, I was out there all by myself, I had been driving around for more than an hour and had encountered maybe two other vehicles, and right now it was 35 degrees – and the sign was telling me to use my jacket to scare off any lion. What jacket? And after ‘my encounter’ I was expected to be alive enough to report the incident? Yep, I turned around, got straight back in the car and drove off to another site. One last story for now. Australia’s occupation by the English commenced officially with the landing of Captain Cook in Botany Bay. Such an important site in any other country would most likely be crowded over with monuments and tourist facilities. 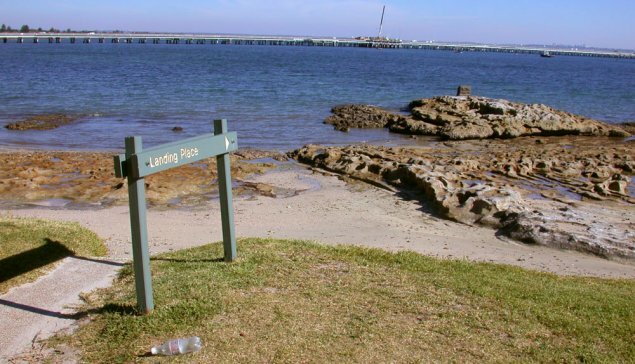 Several years ago we ventured out to see what was in place to mark this significant spot in Botany Bay. There used to be a road sign south of Tuggeranong that said “City” to the right and “Town Centre” to the left. Even Canberra people would find that confusing. Should have got a photo. 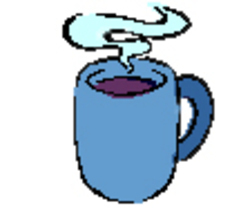 Is it still there? 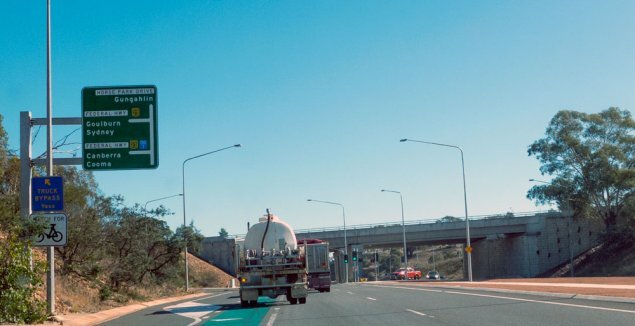 “Signs can be mysteriously misleading if you are not familiar with what they are trying to communicate.” – which is, of course, the key to understanding many road signs in Canberra, and elsewhere – they only make sense if you really don’t need them. A few of those famous bullet-ridden “Do Not Shoot At This Sign” signs, just inside the ACT border, would do so much to broaden the tourist appeal of our fair city. Like turds around the sign that says “No Dumping”. They are trying to give city status to Gungahlin so the tram can be renamed the ICE TRAM. (Inter City Express that is). In fact, ice on the rails and on the power-lines could stop the tram/s in their tracks. Hysterical! Oh really, your insane fear mongering of non-issues just brings tears to my eyes. 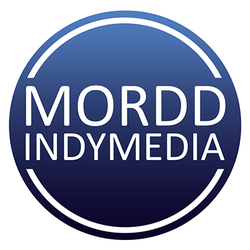 Hey Rubaiyat, would you be able to get in touch with me via RA or my Facebook page (just search for “Mordd Indy Media” on facebook) if possible, thanks! I’ve never seen a pollie in the flesh. I have; Kevin Rudd, when Prime Minister, at my old work place, Kim Beazley at the next table in a restaurant (which is amazing, as I rarely eat in restaurants), Bill Hayden at horse riding (if fact :D, I can say I went riding with the Governor General – okay, we were part of a group and he was a surprise extra), John Howard at a function at Parliament House. I used to see Malcolm Fraser walking to work. There have likely been others, but those are the ones that come to mind. I could add the local Politicians too. I have seen a number of them attending local functions, and also near election time had at least one of them knock on my door. When I was a courier at the Dept of Finance in 1982 I saw Sir Joh Bjelke-Petersen arriving at Old Parliament House for the Premiers Conference. Whatever you might think about Joh, he was a colossus at the time, and it was like seeing Sir Winston Churchill. So let me get this right. 15 posts whining about the use of the word Canberra on a street sign rather than City Centre? And then drawing the attention to Gungahlin seemingly not being part of Canberra as a result. Gee no wonder people make fun of Canberra. And OP, again lots of whining yourself, but if you were in charge of street signs what would you call the city centre on said signs? I have; Kevin Rudd, when Prime Minister, at my old work place, Kim Beazley at the next table in a restaurant (which is amazing, as I rarely eat in restaurants), Bill Hayden at horse riding (if fact :D, I can say I went riding with the Governor General – OK, we were part of a group and he was a surprise extra) – John Howard at a function at Parliament House. I used to see Malcolm Fraser walking to work. There have likely been others, but those are the ones that come to mind. I could add the local politicians too. I have seen a number of them attending local functions, and also near election time had at least one of them knock on my door. 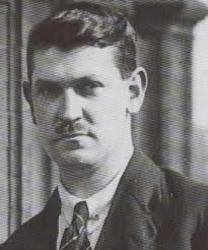 A few have been “caught in the flesh” at Fyshwick. It has probably been mentioned before but one of the best/worst signs is the one in Gordon directing traffic to Point Hut Crossing. 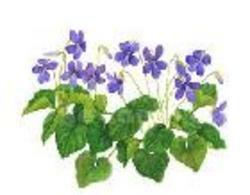 The word “Crossing” has been abbreviated to “Xing”. It must surely confuse the Chinese tourists. Well, if it wasn’t serious it would be funny. A bit like Morisset St in Queanbeyan. On the signs it was spelt Morriset, Morrisset, and Morisett. A few years ago someone picked up the errors and new signs were installed with the correct spelling throughout. And I guess it is only a matter of time that the sign ‘landing place’ at Botany is changed to ‘invasion place’ to be consistent with the history books that are being changed as well. What a great idea – those who use the word ‘reconciliation’ so much will surely make it so. What better way to achieve reconiliation than to tarnish contemporary individuals with the sins of others in history who happen to share their skin colour? Yes, reconciliation is clearly a journey, not a destination. Time to cut off the funding and it will quietly go away. Never seen anything as true as that. And I guess it is only a matter of time that the sign “landing place” at Botany is changed to “invasion place” to be consistent with the history books that are being changed as well. …and, like, the events that took place, but don’t let’s have facts get in the way of the great national pasttime, The Good Old Aussie Whinge.